It’s about time. 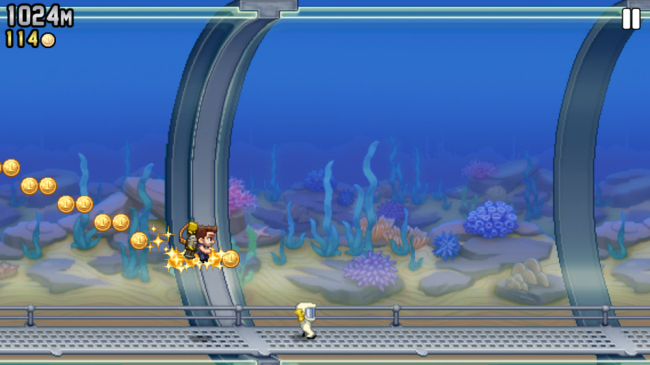 Halfbrick Studios (makers of Fruit Ninja and other delicious titles) has brought Jetpack Joyride to Android. The game has seen large success on iOS and there’s a good reason why. It features fantastic controls and gameplay that never gets boring. You play as a character that steals a Top Secret jet pack and obviously, you go for a joyride. While flying around you can hit power-ups which can turn you into a big mechanized machine, a jet-powered dragon, and tons of other fun stuff. It’s available for free, but the only downer is that you’ll need the Amazon Appstore installed to use it. Bummer.